Hello, and welcome to my online portfolio. Here you'll find my teaching philosophy, education, experience, relevant prior career highlights, work samples, and personal information. In 2018, I received a Master of Arts in Teaching in Elementary Education from Rhode Island College. I look forward to a rewarding teaching career, bringing years of experience as an industrial designer, creative problem solver, artist and musician into my classroom. I believe that my foundation in STEAM enhances my work as an elementary educator. It inspires me to share my fascination with exploration and discovery, and to help my students begin a lifelong love of learning. 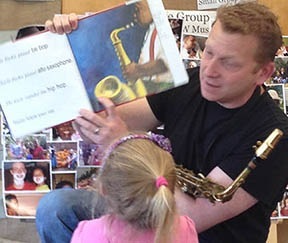 Above: "Musical Read Aloud" about musician Charlie Parker, with saxophone playing for context. Below: First grade students sharing collage pieces they created in my afterschool art class. If you are visiting to learn more about me in consideration for a professional opportunity in elementary education at your school, please feel free to contact me directly with any questions or requests for additional information.